Detailed contracts of employment are becoming more common in Canada. The purpose of these contracts is to clearly set out the terms of the working relationship. 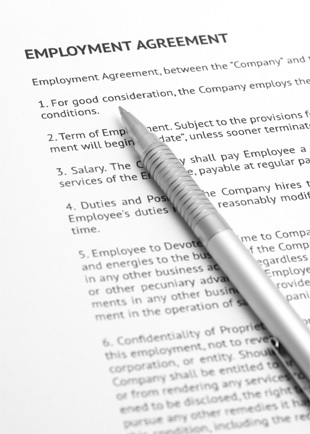 The employment contract forms the cornerstone of the employment relationship. These contracts typically contain terms related to compensation, benefits, work description, termination and rules and conditions in the workplace. It is therefore imperative that all terms and conditions are understood. Canadian organizations are becoming more aggressive in their use of employment contracts, and employees often unwittingly sign away many of their rights when they accept an offer without seeking legal advice. Having a trusted and experienced employment lawyer review the language of your employment contract prior to agreeing to it is a crucial step in protecting your rights, particularly if you are being lured away from your previous organization, or you have been provided with a contract containing extensive terms and conditions. MacDonald & Associates lawyers have reviewed countless and varied contractual agreements, and will apply their vast expertise, especially to provisions beyond a company’s standard employment contract. We will review all the terms of your contact, even some that may outlast your term of employment, such as non-disclosure and non-competition/solicitation clauses and intellectual property, make sure you understand them, and help you understand the consequences of each one. Natalie, congratulations! I would expect you and your partner to be quite successful in your new partnership. You bring a wealth of experience and strong background in employment law to the firm. Your excellent guidance and support plus the savvy you demonstrated on my behalf a number of years ago allowed me to control a rather nasty situation I found myself in concerning contract employment law. Again, congratulations and I look forward to following your successful career.